This article covers the history of WikiFur and related projects. July 23, 2005: Conceived by GreenReaper when creating a Wikipedia article on The Blind Pig. July 24, 2005: WikiFur founded on Wikia. July 31, 2005: The first content pages began to appear. August 4, 2005: GreenReaper wrote WikiFur - a home for the furry community on the talk page of Wikipedia's furry fandom page. Surprisingly (considering previous edits), there was no discussion, but a few people did join as a result. August 13, 2005: With editing totaling around 50 pages, WikiFur was promoted with GreenReaper's I Have a Dream message, cross-posted to several LiveJournal communities (it was, perhaps appropriately, deleted from Yerf's ;-). In a deserved burst of bad karma, the server went down and stayed down for hours. August 14, 2005: Trolling began, led by users from the fursecution LJ community and Encyclopedia Dramatica. It should come as no surprise, but in case you were wondering: "yes". Yes, there is a Wiki for furries. Don't spam it up, if only out of respect for the wikipedia ideal. As a result, a mass of users hit the WikiFur servers. At the peak one edit was made every 45 seconds. At first we thought it was just an extension of the previous trolling, but as I tried to record the IPs and figure out some sort of pattern, I saw they were all over the place. Our next thought was proxies, but even then, there were just too many edits. Finally a vandal posted the URL while making an edit, and so we found out exactly what happened. Then we got chosen as Awful Link of the Day . . .
August 20, 2005: Within the first week of openly promoting WikiFur, it had grown 32 times over, and there were over 1600 pages and 646 full articles on the site. Statistically, there was a new edit every 2 minutes, and a new page added every 20 minutes. August 21, 2005: A WikiFur article was created on Wikipedia by an anonymous user, and almost immediately submitted to Votes for Deletion on grounds of non-notability. Nobody actually at WikiFur heard about this until later in the week. The majority of votes (including those by WikiFur admins) were for delete, due to unproven notability. August 23, 2005: Passed 750 article pages. August 25, 2005: Passed 850 article pages and 10000 edits. August 28, 2005: Passed 1000 articles pages in the early hours of the morning, minor celebrations are held. October 30, 2005: The main page and Community Central were redesigned (and the latter renamed) to celebrate the creation of WikiFur's 2000th article page. December 1, 2005: WikiFur pipped Wookieepedia to becoming December's featured wikicity. December 13, 2005: WikiFur passed 2400 articles. December 30, 2005: The 2500th article page begun. January 15, 2006: 2600th article mark reached. February 5, 2006: 2800th article. February 11, 2006: Advertising begins with Google AdSense. February 21, 2006: 2900 articles reached. March 27, 2006: Because of confusion around the name (are they wikis about cities?) and a desire for a better name to reflect that they are not just another wiki community, WikiFur's host changed from Wikicities to Wikia. WikiFur's URL changes accordingly to furry.wikia.com (though the old address still works as well). April 1, 2006: WikiFur underwent a short seasonal alteration. April 23, 2006: 3500 articles reached. June 13, 2006: WikiFur partners with Finnish-language furry wiki Turriwiki. June 16, 2006: First WikiFur Meetup was held at Anthrocon 2006. Around 25 furs attended. June 21, 2006: 4000 articles reached. June 29, 2006: WikiFur was referenced in Animal Passions, a Pittsburgh City Paper article covering Anthrocon 2006. July 24, 2006: WikiFur celebrated its first birthday, having just passed 4400 articles. September 20, 2006: 5000 articles reached. December 17, 2006: 6000 articles reached. February 17, 2007: WikiFur News launches. May 10, 2007: 7000 articles reached. July 10, 2007: 7500 articles reached. August 14, 2007: Czech edition is founded by Xkun. September 25, 2007: 8000 articles reached. October 28, 2007: German edition is founded by O'wolf (technically a couple of months before - this is when edits and content started appearing). By November, it contains 170+ articles. February 7, 2008: Portugese edition is founded by Ekevu. March 30, 2008: OVER 9000 articles. September 12, 2008: Spanish edition is founded by Argox and Fibonacci. September 24, 2008: Russian edition is founded by OckhamTheFox. October 7, 2008: 10,000 articles reached; multilingual portal launched at dedicated domain, wikifur.com. October 21, 2008: Polish edition is founded by Ulbrek. April 9, 2009: 11,111 English articles reached. March-April 2009: WikiLurv (Swedish affiliate) reaches 100 articles. May 4, 2009: Italian edition is founded by Ylon. April-May 2009: Russian edition reaches 500 articles. June 6, 2009: French edition reaches 100 articles, two years after its creation; Japanese edition is founded by Sonotairoiro. June-July 2009: Chinese edition crosses 50+ articles. November 12, 2009: 12,000 English articles reached. October-November 2009: Polish edition reaches 100 articles. January 11, 2010: Flayrah acquired by GreenReaper, retooled as offsite replacement for WikiFur News; non-WikiFur-specific news from WikiFur News is merged into Flayrah archive. February 12, 2010: Dutch edition is founded by Kashidom. February 25, 2010: Estonian edition is founded by ValkaTR. 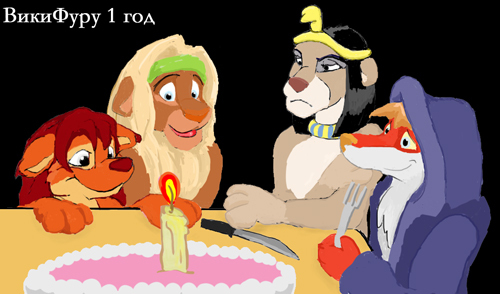 March 14, 2010: The Russian WikiFur reaches 1000 articles. August 2010: The Czech edition reaches 100 articles. February 2011: Russian edition reaches 2000 articles, doubling in article count from March 2010. April 18, 2011: The Fursuit Wiki is launched. May 2011: Chinese edition reaches 100 articles, having experienced rapid growth in article count in the prior month. June 15, 2011: Korean edition is founded by Authen. July 2011: Spanish edition reaches 500 articles; Portuguese edition reaches 100 articles. September 11, 2011: Esperanto edition is founded by KuboF. April 3, 2012: 15,000 English articles reached. Some of this page is derived or split from another article on WikiFur. The original article was at WikiFur. The list of authors can be seen in the page history. Unless otherwise stated, the text of WikiFur is available under both the GNU Free Documentation License and the Creative Commons Attribution-ShareAlike 3.0 license (CC-BY-SA).